The Historic Muckenthaler Mansion is located on 9 acres of park-like grounds. With a vista of gently rolling gardens, swaying palms, and picturesque architecture, we have the ideal setting for your special day! The Mansion, built in the 1920’s, has one of a kind architecture making it a stunning backdrop for your wedding. Ceremonies are held in the intimate Italian Garden, enclosed with lush palm trees and foliage. Sit down receptions can be held indoors for up to 120 guests. Outdoor receptions are located on the Adella Lawn which can accommodate up to 400+ guests. Outdoor receptions are located on the Adella Lawn which can accommodate up to 400+ guests. Ceremonies are held in the intimate Italian Garden, enclosed with lush palm trees and foliage. The Mansion, built in the 1920’s, has one of a kind architecture making it a stunning backdrop for your wedding. 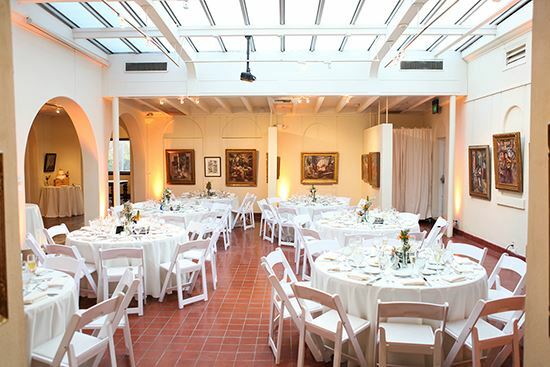 Sit down receptions can be held indoors for up to 120 guests. After much searching, my fiance and I came across the Muckenthauler Mansion in Fullerton, CA. It could'y have been more perfect! The venue accommodates around 150 guests and the catering offered is amazing. Costs were on the reasonable side...on Los Angeles standards that is. We're currently in the planning stage of our wedding and they have been extremely helpful along the way.